Mamiya 6 – Test Shot #3. ↑Mamiya 6 + 50mm + Kodak Porta 400. Lovely winters day light there Peter. And one fearless goalie! So have you found the 6 much different when shooting than the 7? The collapsible lens mount is a great feature however. And the camera seems better built than the 7. It doesn’t speak it sings. The composition, the way you’ve carefully framed the eye, the lighting and the Portrait palette, just wonderful. Peter, your medium format film work has a whole other sensibility and soul to it. What ever it is doing to your thought process is wonderful and you need to do more of it! Thanks for noticing those details David, and for your generous comments! 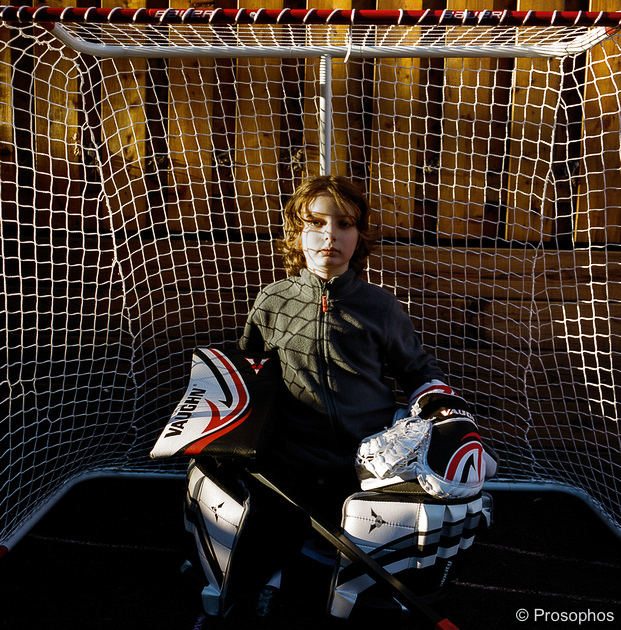 And yet, the image lacks something… I believe it’s because our little goalie was recovering from a viral illness and he looks deflated. The normal spark I look for is not there in his eyes, despite the beautiful external light. Still, I like the image… and am glad you like it too. And I’ll keep plugging away with medium format film.